When I was researching 19 affordable mid century modern sofas, I came across Room Service, a sofa maker in Los Angeles. Several of their sofas are right at my $2,000 “affordable” benchmark, others are higher. 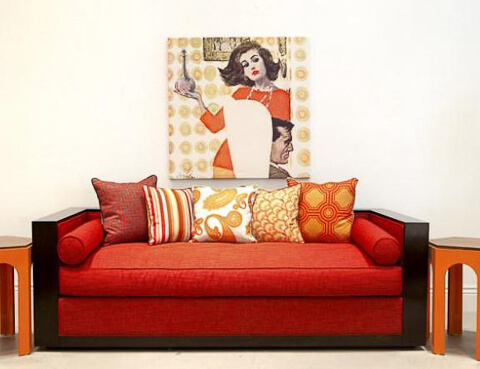 In any case — Room Service’s sofas and sectionals most certainly win my heart for their big bad bold colors and style. Here’s their Down With Love sofa in this year’s Pantone color of the year, Honeysuckle. According to my eye, Honeysuckle is pretty much identical to Sherwin Williams Suburban Modern paint palette’s “Flamingo.” Funny — or not so funny — how marketers feel like they must name the retro colors something more “contemporary” to sell into today’s market. A flamingo by any other name would look as pink. Of course, you know what color I’m all about this year. Look how nice orange plays with brown. Orange is a very cooperative and versatile color. I personally never met a tufted sofa that I didn’t like. Even if the tufts were in the “wrong” places. Do I spy bargello or bargello-like pillows? and acid green… pea green… lime green… avocado… yum. Click here to check out Room Service’s sofas and more. 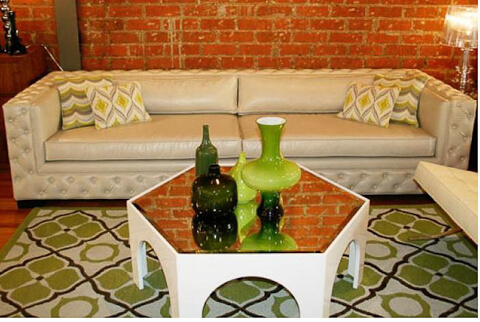 I am seriously considering purchasing the Modern Retro sofa from this company. Has anyone actually sat on any of these, or can anyone speak to the overall quality? 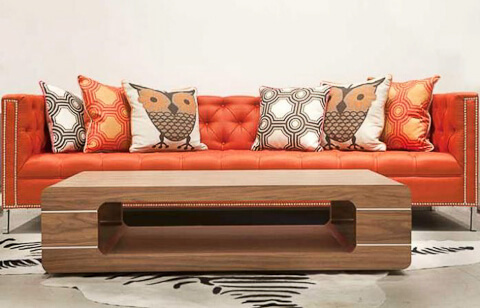 Also check out buildasofa.com They have great MCM choices!